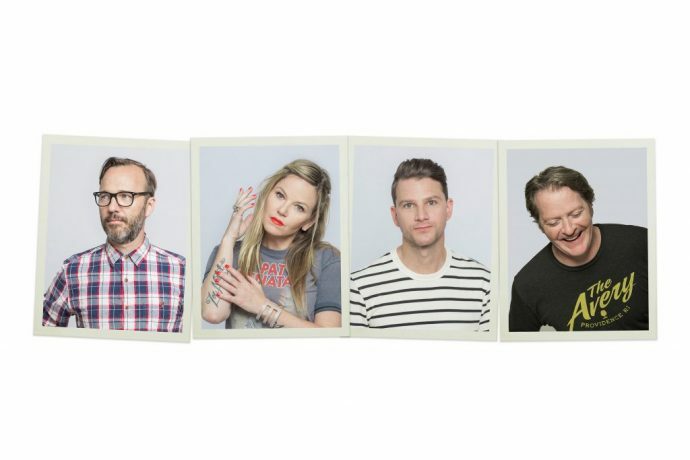 Boston alt-rock band Letters to Cleo had several hits in the 90s like “Here & Now” and a cover of “Cruel to Be Kind” from the 10 Things I Hate About You soundtrack before breaking up in 2000. After several small reunion shows/tours, the band recently reunited and released a new EP, their first new music in 17 years. Surviving the Golden Age caught up with longtime guitarist Michael Eisenstein to chat about the reunion, the EP, and David Ortiz’ retirement. Who approached who about getting back together and recording new music? I ran into (Cleo drummer) Stacy Jones at a Johnny Polonsky show in LA about a year ago. We were chatting and he said he was going to take some time off the road and focus on writing for most of the next year. He just came right out and said “we should write some Cleo stuff.” I said I was into it and would put it out there to Kay (Hanley.) She nervously agreed and then we emailed Greg (McKenna) who right away started emailing us song ideas. It was pretty much like the old days once we got into the groove. Like I mentioned earlier, Greg had sent along MP3s of a few guitar riffs so when Kay, Stacy, and I got together for the first writing session, we started with an idea of his that we all liked. Within a couple of hours, “Can’t Say” was more or less written and arranged. None of us listened to it for a few weeks til the next writing session. When we did, we were shocked that we actually liked it and that lit a fire under us. We wrote a couple more and went right into the studio to start recording them. Then Greg flew out to LA to do some overdubs and write the last two all together. You are embarking on your first tour since 2009, what can fans expect from the tour? We’re not trying to reinvent ourselves at this point. We are going to do what we do best, which is a loud, fast, rock show. Not a lot of beating around the bush. We’ll give you a cross section of our entire catalog in rapid fire succession. How were relearning the old songs? Any of them give you trouble? Well, it helped tremendously that we did a handful of reunion shows back in 2008-9. I remember having to work a bit more that time. That said, I put on GO! the other day and “I Got Time” barely even sounded familiar. There’s a high degree of muscle memory with this stuff though; once we’re all in the room playing together, my hands tend to know where to go. What are your thoughts on David Ortiz’ retirement? It’s impossible to call him the greatest player in the history of a team that has had Cy young, Babe Ruth, Ted Williams, Yaz, and Roger Clemens but can you really place value on completely changing the image of a franchise of over 100 years? Not a person alive thinks of the Sox as losers or chokers any more. He was the one who consistently delivered when his forebears found new ways to fail. He turned generations of pessimists into believers and possibly altered the psyche of New England. His career with the Sox went from Nomar Garciaparra to Xander Bogaerts and probably 250 players in between. Personally, he is really the last link to the Red Sox when I lived in Boston and would go to games at Fenway routinely so I’m extra sorry to see him go.